The following error may appeared on Windows 10 or 8.1 computer during boot process "An operating system wasn’t found. Try disconnecting any drives that don’t contain an operating system. Press Ctrl+Alt+Del to restart". The "An operating system wasn’t found" error can be displayed on Windows 10 or Windows 8.1 computers, after a Windows upgrade (e.g. from Windows 8.1 to Windows 10), a BIOS update, or after you have cloned your hard drive to another disk. In this tutorial you can find detailed instructions on how to resolve the ""An operating system wasn’t found. Try disconnecting any drives that don’t contain an operating system. Press Ctrl+Alt+Del to restart" on Windows 10 or Windows 8 or 8.1 OS. A. Set your internal hard drive (with the installed OS) as the first boot device on the BIOS Setup settings (or the Windows Boot Manager if you own an UEFI System). B. Disconnected any other USB drives (or devices) connected on your computer. Method 1: Perform a Windows Startup Repair. Method 2. Configure and Repair the Boot files. 1. Place the Windows Boot Media on the computer and boot from it. 2. At the first setup screen, choose your Language, Time – Currency and your keyboard input method and click Next. 3. At the next screen select Repair your computer. 4. Then click Troubleshoot –> Advanced options –> Startup Repair. 5. Wait while Windows diagnosing and fix problems. 6. When the Startup Repair is completed try to boot in Windows normally. – If your still receive the "operating system wasn’t found" error or if the Startup Repair couldn't repair your PC, continue at Method 2 below. Method 2. Configure and Repair the Boot Files (Options). 3. At the next screen simultaneously press the SHIFT + F10 keys to open the command prompt. Look at the GPT column to see if it has an asterisk (*). 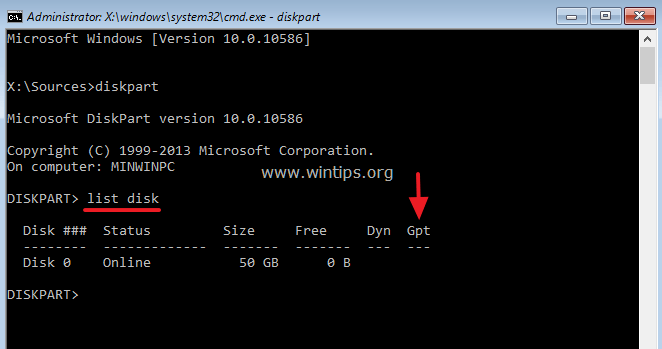 – If you see an asterisk (*), that means that your disk's Partition Table is GPT. – If you don't see an asterisk, that means that your disk's Partition Table is MBR. 7. If the partition table is MBR then read and apply Part's 1 instructions to resolve the "Operating system wasn’t found" problem, otherwise – if the partition table is GPT – read and apply Part's 2 instructions. * Note: If Windows are located on a different drive, change the letter D with that drive letter. "Boot files successfully created "
7. Type exit to close the DISKPART tool. 8. Close all Windows and reboot your computer. 9. Remove the Windows 10 Boot Media and boot to Windows normally. * Note: If the Windows directory is displayed then continue to the next step. otherwise continue by typing the next alphabet letter until you found which drive contains the Windows folder (e.g. dir d: , dir e:. dir f:, etc.). 5. Then type the following command and press Enter. 6. 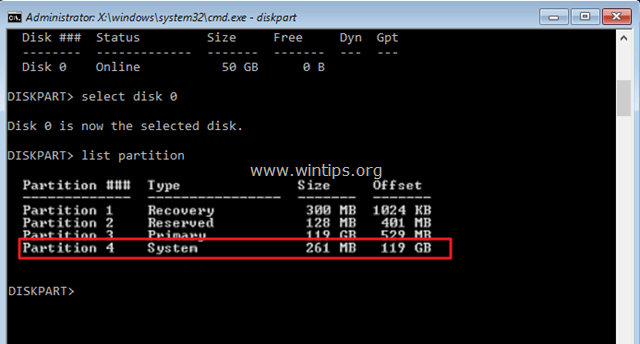 Find out which Partition is labeled as System. 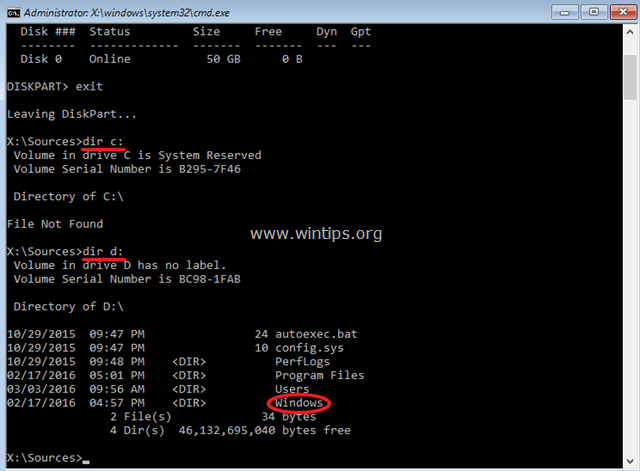 select partition X (Where “X “is the number of the partition labeled as System. e.g. “4”). * Note: If the drive letter "S" is already used, then give the next drive letter in alphabet. 8. Type exit and press Enter to close DISKPART tool. 9. Then give the following commands in order (press Enter after typing each one of them). 1. Change the letter "S" if you have assigned a different drive letter to the System partition. 2. If Windows is located on a different drive then use that drive letter instead of "C". 3. 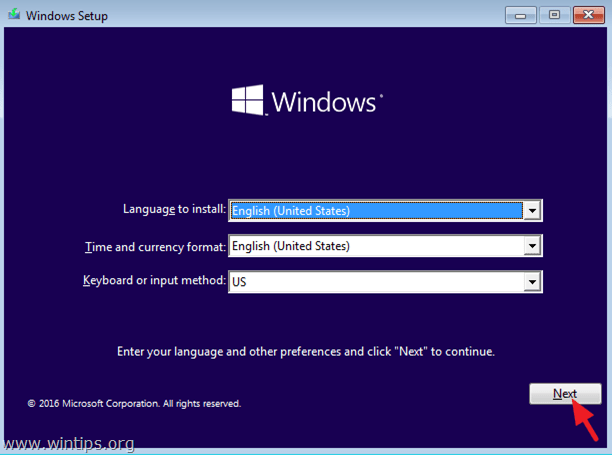 The "/l en-us" part of the above command sets the Windows language to English. If you want to set a different language, then replace the "en-us" with the appropriate language code (e.g. "fr-FR" for France). 10. Close all Windows and reboot your computer. 11. Remove the Windows 10 Boot Media and boot to Windows normally. « How to Test & Diagnose RAM Memory problems. » FIX: SysPrep Fatal error: dwRet = 31, Machine is in an invalid state or we couldn't update the recorded state. I partially fixed "An operating system wasn't found" thanks to your precious tutorial. "Partially" as my computer still wouldn't start Windows after that. I usually enter UEFI (by typing Del "to enter set up") and change the order of booting there. But in this case, that wouldn't solve the problem, the operating system still wasn't found. That's where I realised I had the possibility to "enter boot menu" straight with F11, which takes me to a list where I'm invited to "please select a boot device". Double-clicking on my SSD listed there and there starts Windows. Problem is this booting order won't stay. After restarting the computer, the infamous "An operating system wasn't found" is back. Any idea what causes this and how I could solve it? I don't really understand on what it's booting since I do order the OS to boot on the proper disk. My first problem was the OS freezing for no reason, and it then evolved into this. And I guess I first need to solve the booting part before running diagnosis (already bookmarked some of your posts) and understand if this is soft or hardware-related. I'm running Win 10; MBR table. Ran a Malwayrebytes scan, no threats detected. @François: Since you have MBR table, enter BIOS Setup and Set the 'Boot configuration Mode' to 'Legacy' and also Disable the Secure Boot. Save and Exit from BIOS Setup. Then enter in BIOS Setup again and set as first boot device the SSD Drive. Thanks man! You saved my life! 110% fantastic, take a bow sir! 1. You have 2 internal disks on your machine (at this case disconnect the NON OS disk before applying the steps in the article)…OR…. 2. The first one is the internal disk and the second one is a USB drive. I suggest to read carefully the instructions in order to fix the issue. @Brian: Diagnose the drive for problems. Thank you so much. It worked, i'm using the part 1 guidance and the OS is back. Good work. Thanks for this clear and well-written guide. I got this error when reinstalling from a USB flash drive and was stuck, but following this guide fixed it. It's ridiculous that Microsoft still hasn't fixed this in version 1809. Best troubleshooting guide I've ever seen. And I've seen A LOT. Thank you. Agree with Robert Morrison. If only they were all like this . Thank you ever so much. This shouldn't be so complicated. Excellent work done. Hats off and respect. Keep sharing such a wonderful tricks. wuhuuu, you are my hero!!! Thank you very very much for this excellent tutorial! Thank you very much.Guide helped me.I had solved my problem. You are awesome! Thank you very much! I used the MBR path and it worked flawlessly. I just built a new PC and was having issues with it wanting a bootable drive to be inserted. This was even when I had my M.2 containing the OS listed as 1st in my boot priority. However, I could still get it to go to Windows via a work around by booting into my BIOS every startup then exiting without saving changes… worked every time but very annoying. Then, I went to Disk Manager and set my OS M.2 as "active" and that's when I got the error that you described the fix for here. thank you very much for taking the time to write up this tut. i thought my computer was done for but this brought it back to life. I love you! I almost spent my rest day fixing the problem. I'm crying right now. Thanks much! Thank you, it was absolutely helpful! My pc is bootig in UEFI safe mode and it doesn't allow any external media to boot.what to do? @rahim: Follow the instructions from this article to create an UEFI Boot media and to apply the recommended settings in BIOS in order to boot from the UEFI USB flash drive. You save me from my dad. Thanks to your assistance with this article I was able to resolve the operating system not found on my network computer system this morning instead of having to reinstall everything again, ordered a backup server external drive to help with all system backups… Kudo's from an A+ Certified Tech that never has encountered this issue before…. Man you are a life saver! Thanks to you I fixed my laptop without losing data. Thank you, you really saved me with this! I really didn't know what to do without this article! You saved my life! It works for a MBR partition. It worked! and still, I'm kinda curious. How does it happen? and how does that fix it? Do you mind give me some answers here? Thanks. It really worked. I had a problem with selecting the volume containing system files but somehow I found it and boot successfully. All thanks to you! it was quite complicated but following your guide step by step I fixed it! Thank you a lot. Maiby could you ad the write directly in the guide the link to download the windows installer? in my case it is mbr type. i have followed everything step by step carefully and got the same messages as you have in your screenshots, but still i am getting the same error "An operating system not found………..". i have used all of the bootrec options also. @NAMAN GUPTA: Try the following: Enter into BIOS and change the SATA mode to AHCI (or IDE) & also disable the Secure Boot . Then apply the instructions on the article again. I have 4 partitions in my system. Among these C:\ is my system disk. Now I am unable to opening my windows. When I was unistall Reboot Restore Rx then problem start. Now as per your instruction I did all above method but not success then I open notepad through cmd and I found new disk Boot X. There is windows file but not show windows in other drive. Windows must be in drive c but not show system ease. What to do ? @Nick: Drive X is the drive which contains the Windows installation media. Read carefully and apply the instructions in Method 2. I went through ten different tutorials and this was the only one that could really help me! I got my computer working and and all my documents were saved. Thank you, thank you, thank you! worked for me, thanks a lot mate!!! My problem started when I allocated new volume on hard drive and reboot PC. This helped me (BTW I did not believe :) ). i created multiboot dvd with wintohdd and this erro came up. (create 2 partition ,one for boot,one for iso's and its own boot) as i follow you tutorial,there was "windows" mentioned..as this has no windows,so how to proceed to solve this problem dear? @amir: Change the Boot Mode to LEGACY & Disable the SECURE BOOT in BIOS Settings and then apply the procedure again. Thanks! This helped me out a lot. The startup repair never works. Your instruction did the trick!! Thank you !! I tried hours of other fixes for this and yours was the one to work. Thank you so much. Seriouly I appreciate this BIG TIME. Awesome bllog, keep up great work guys! Hey Lakonst, I received the "blue screen of death" and decided it was best to just reset the PC. Halfway through the process, the program just finished and stated it couldn't finish. Kept getting the "operating system wasn't found". I have came across your guide and still nothing. Startup repair does not work(it won't even start the process). My disk is healthy per the HD TUNE you recommended. The partition table is MBR and when following the steps provided i get a "failure when attempting to copy bot files". I tried to adjust the SATA mode is set to AHCI and can not adjust. BCDEDIT shows "the requested system device cannot be found". Also seems like this hard drive has 3 disks on it(SYSTEM, HP_RECOVERY & OS) model # WD5000AAKX. Please help!!!!! I have run out of options!!! @Randy: Why you cannot change the SATA Mode? What is the Motherboard/Computer Model? Anyway, If the installation is not finished and the disk is healthy, then maybe the RAM or the VGA is damaged. So, first Check RAM for problems and – if you own a desktop – replace your Graphics Adapter. Then re-download a windows 10 installation media and burn it to a DVD or USB and use that media to perform a fresh Windows 10 installation. Well when I go into the Hewlett-Packard Setup Utility, under the "storage options" It doesn't let me switch between different types of STAT EMULATIONS. I will check the ram problems as recommended. @Randy: I think that you cannot change the SATA MODE in BIOS settings for the disk controller, because on some HP computers these settings cannot be changed (locked), and normally either AHCI or RAID is enabled by default depending on model. So, contact your computer's manufacturer to find more about this issue. Also, when I boot with the usb, its showing "bootmgr is missing"
@Randy: "bootmgr is missing" error means that your system cannot find a properly configured device to boot from (the boot sector is damaged or missing). Try to install Windows 8 or 10, from a DVD installation media. @mokone: What is the error you receive? I fixed it…..But can it happen again?? Guide worked perfect for me! Thanks! @inmer: If the OS disk is recognized in BIOS Setup, then repair the boot files using method 2.
bcdboot c:\Windows /l en-us /s S: /f ALL It's the same o I will have some problems later? Thanks a lot man. You saved my pc????? Thank you so much. It worked! You saved me from crappy microsoft support page! Thanks man ! U saved my day. A few days ago, my computer crashed. These instructions were crucial to me getting a diagnosis and ultimately getting the computer back online. Thank you so much!! When I got to enter "3. Active" , I got an error message. The specified partition type is not valid for this operation." Everything went through without any problems until reaching here. "DiskPart has encountered an error: The request could not be performed because of an I/O device error. See the system log for more information." Everything was working perfectly up to that point. We sold our computer to someone who somehow wiped the hard drive and without a disk could not restore. I went to Best Buy and bought a new Windows 10 Home Full Version. I cannot seem to install the new version no matter what I've tried. Please help. @Lauren: If the drive is wiped you have to re-install Windows, but I think that the Hard drive is damaged. Replace the hard disk and try again. Thanks a lot! Muchas gracias, has dado en el clavo con la solucion. Seems to have worked for me, thanks so much! BFSVC Error: Failed to populate BCD store. Status = [c00000bb]. 6. Find out the EFI volume (its about 100MB). 10. Close all windows and reboot. Good luck! Wow, I don't know how to thank you sir. You are amazing! Thanks a lot.God's will help you.. I've tried every possible thing. Time after time I get your PC couldn't start properly and then I need to use recovery tools. What do I need to do? This is my pc for school and everything in between! @Isaiah Miller: Diagnose your hard disk for problems https://www.wintips.org/test-and-diagnose-hard-drive-for-errors/ and then I suggest to perform a fresh OS installation. @Zharra: Commonly the System partition is the largest partition in size. Worked for me. But I was confused in 1.Part, 5's subpart – "select disk x" – I thought x was a partition and couldn't find it, but it meaned a whole hdd. Boot files are on MBT Partition Table. I typed almost all dir and it says it cannot be found. I tried BCDEDIT and it says:"The boot configuration data store could not be opened. The requested system device cannot be found." Help? 2. Note the drive letter of the largest partition in size. This is probably the Windows partition. 3. exit DISKPART tool and follow the rest steps in guide. @Joel: Probably you have chosen a wrong drive to assign the drive letter. Please follow the instructions from the start! But after I try to create safe point on my PC it stack and same error appears on startup. No errors during the process described in Part1. Check bios and found the problem. Some how hard drives change their priority, and OS drive was off. It says the system cannot find the path specified. I assigned the letter succesfully. I have got windows 8.1 will this still going to work? @Ozair: Power Off and Power On the machine. OMV….TY TY TY!!! I had to guessimate on somethings, for I have 2 disks, nothing saying System, but figured it out. I lost my OS when was resetting my older PC (giving it to my oldest son). I did the resetting, just fine, but got a message saying not all of my personal information was removed and to do a reset again. I did it, and after it was done, that is when got the "message" I had tried everything, that I knew what to do, but with no luck. Thank goodness I found your post. The computer is working and my "Insane Elephant Eye" is gone. Man, what a guide. I was going nuts with these, considered even wasting my SSD. I've had tried so many fixes and none had worked. Thank you! It worked beautifully! Good work! It says A duplicate file name already exists, or the file cannot be found, when i enter ren bcd bcd.bak. Can you please tell me what's the issue? It's my second time applying the same method within a week. Last time it worked properly. Man, today, you're my hero! I spend almost two weeks trying to find the solution with no success. Until now… Now im happy!!! Welcome to asus motherboard make disk for bos menu. @Blackwater4: If you have formatted the disk, then you must boot your computer from a Windows installation 8 media (USB or DVD) and install Windows again. When i run the command bcdboot C:\Windows /S C: it says Failure when attempting to copy boot files. What do i do ? @Sakari Hast: I suppose that you have typed the command wrong or your hard disk is damaged. I wrote the command right but if my hard disk is damaged how do i repair it ? @Sakari Hast: First of all, connect the hard disk (if you can) to another working computer and diagnose it for problems by using the instructions in this article: How to Test and Diagnose Hard Drive (HDD) for hardware problems. If the disk is damaged, then you have to replace the disk. Worked like a charm. thank you. wish you the best for everything. Excellant!! Thank you very much. I put all letters to find my 'dir' but it cant be found!! Help me!! Just shut down the computer, and then turn it back on, and click F4. You will know the rest. This method helps me. ….. "PART 1. Fix Boot Files on MBR Partition Table"
So as for my question does anyone have any ideas? I Did everything right, But it didnt work. It still says "An operating system wasnt found…"
@Tomfred: Backup your files (by attaching the disk to another working system) and then re-install the OS. @likando: Press Power button for 10 sec to Shutdown the computer. Then Power it up again. @Type EXIT and press Enter. After i enter the 'bcdboot D:\Windows /S D:' it did't show boot file successfully created but it show "failure when attempting to copy boot files"how do i fix this? @Syazwan: Probably Windows were installed in another disk. I can't find the correct directory with the windows folder. I've typed "dir a" through "dir z" and get the same message every time. It says "File not found. Volume in drive X is Boot. Volume serial number is XXXX" Any idea what I should do next? Thanks!! 4. Follow the instructions in the tutorial to fix the partition table.